Longitude 47.936515 Latiude 1.404866. The Fairies Rock or ‘Rock of the Fairies’ (Roche-aux-Fees) prehistoric monument is located in a wooded area with oak trees and a small lake about half a mile north-east of La Roche village, Illet-et-Vilaine Dept, central Brittany, near the D341 La Motte road. There is a small car park. The site is two-and-half miles south of Esse and some 3 miles north-west of Retiers. This famous passage-grave is said to be the largest dolmen in France and, it is quite probably the best preserved of any of the dolmens in Europe. In the Breton language the word “dolmen” means table of stones or simply ‘a stone table’. Fairies Rocks, Brittany (After P.Mesney). There are 40 huge stone slabs here, some reckon on there being 42, but it is difficult to reach a proper total. The dolmen or passage-grave dates from the late Neolithic period sometime between 3,000-5,000 years BC, and was said to have been built by fairies, but in reality this sacred long tomb was constructed by ancient tribesmen for the burial of chieftains, but because it forms an alignment it was probably also used by them to view the Winter solstice on 21st December. The huge slabs of stone have a slight purple colour, but in fact, the stones are made of a reddish basaltic schist that was quarried some 3 miles from here. The passage grave or corridor tomb is 20 metres (65 feet) long, 4 metres (13 feet) wide and 2 metres (6-7 feet) high. Some of the larger slabs and boulders weight up to 40 tonnes, while the smaller ones weigh several tonnes, rather to heavy for the fairies to attempt to lift but hundreds of tribesmen would no doubt have ways of dealing with them. 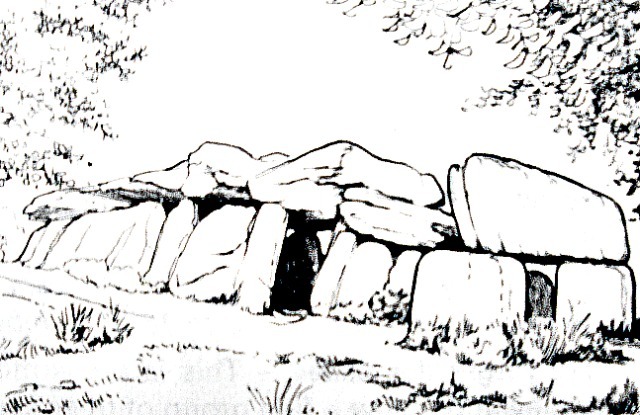 The entrance to the dolmen or passage grave is 3 metres long and is in the form of a porchway (portico) with two uprights and a huge top lintel stone that fits exactley into position. This capstone has some markings at its edges, possibly caused by ropes or something ritualistic. Further inside the monument there is a low roofed passageway or corridor and then a large chamber divided into four compartments with uprights around the sides supporting the rest of the monument and more huge top stones forming the roof. In the central chamber a lump of stone has fallen to the ground. Originally this wonderful grave (tumulus) aligned south to east would have been covered over with earth to a length of 20 metres, but the earth has gone leaving the massive supporting stones. According to legend, young couples would come here to consult with the fairy folk. They were then informed by the little people to do as instructed. The man would have to walk around the stones in a clockwise direction, while the woman went in an anti-clockwise direction, and by the time that both had returned to their starting position each would have to have counted the same number of stones – all would then go well for them in their marriage, but if one had counted a couple of extra or lesser stones they might not find things went their way; and if they each counted by more than two stones then the marriage would not go ahead and they must go their own seperate ways. Well its a good story, and if you believe in the fairy folk, and many people do, then you will almost certainly be captivated by the little tale. Categories: Burial Chambers / Cromlech / Dolmens, Fairies Rocks at La-Roche-aux-Fees in Brittany | Tags: The Fairies Rock at La Roche in Illet-et-Vilaine Brittany | Permalink.